You may have seen the commercials about one of the most popular new ways to straighten the teeth of both teens and adults: Invisalign®. Read on to find out more about Invisalign® and request a free consultation with Dr. F. Michael Sheehan to decide if Invisalign® is right for you. Invisalign® is a teeth straightening program that works for both teens and adults. Invisalign® provides a series of clear aligners that are created specifically for each individual patient using 3D computer imaging. Each aligner gradually and very gently shifts the position of your teeth so when your teeth have adjusted to one aligner, you move onto the next. Your teeth therefore move closer and closer to the desired end result: straight teeth! Many of our patients are thrilled when they learn about Invisalign® because Invisalign® carries with it far fewer lifestyle disruptions and much less discomfort than traditional braces do. Why is Invisalign® superior to traditional metal braces? – Invisalign® braces are clear and virtually invisible: no unsightly metal brackets or wires. – Invisalign® is gentle. Anyone who lived with metal braces can tell you that having your braces tightened every few weeks was a pain – literally! Also, no more abrasions inside your mouth from irritating metal brackets. – Invisaligners® are removable, so you can continue to brush and floss your teeth as normal. No more trying to brush around the metal brackets and wires. When you brush your teeth, you brush or rinse your Invisaligner® in warm water and then replace. It’s that easy. – Invisalign® braces are cleaner. With metal braces, there were always foods you couldn’t eat: corn, caramel, even crusty bread. Really, anything really chewy or sticky was off the menu. But with Invisalign®, you remove your aligner while you eat. When you’re finished, you pop your aligner back in. No more food stuck in your braces. – Your favorite hobbies are unaffected by Invisalign®. Whether you play the trumpet or play on the soccer team, you don’t have to worry about metal brackets and wires cutting up the inside of your lip anymore. 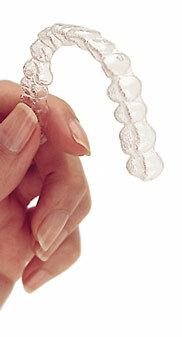 Invisalign® aligners are smooth and comfortable, and, for the most part, are flush with your natural teeth. And, of course, no more worries about getting literally lip-locked when smooching! – Invisalign® also allows you to view your own virtual treatment plan when you start so you can see how your straight teeth will look when your treatment is complete. You wear each set of Invisalign® aligners for about 2 weeks, removing them only to eat, drink, brush, and floss. As you replace each aligner with the next in the series, your teeth will move – little by little, week by week – until they have straightened to the final position Dr. Sheehan has prescribed. How often do I have to see the dentist while using Invisalign®? You’ll visit Dr. Sheehan about once every 6 weeks to ensure that your Invisalign® treatment is progressing as planned. As always, if you ever have any questions or problems between scheduled appointments, you can call our offices and even schedule a visit as necessary. How long will it take for my teeth to straighten to the desired position with Invisalign®? Just like with other teeth-straightening techniques, your treatment time with Invisalign® will vary depending on how far your teeth need to move and genetic factors that control how long it takes your teeth to adjust to each new aligner. Total treatment time averages 9-15 months and the average number of aligners worn during treatment is between 18 and 30, but both will vary from case to case. Are there any downsides to Invisalign®? Anything that might be bothersome about Invisalign® is generally true about other teeth-straightening techniques. For instance, after you get your traditional braces straightened, you will generally feel sore for a few days. The same is true after you first put in a new Invisalign® aligner. It is important to wear your aligner just as much as you normally would, even if you are slightly uncomfortable. Generally, over-the-counter pain medications like ibuprofen and acetaminophen can relieve you of the discomfort for the day or two after switching aligners. Also just like when patients first get traditional braces, you may find you have a slight lisp or find it difficult to say certain words when you first begin your Invisalign® treatment. After all – there is something in your mouth that is changing the way your mouth moves. But don’t worry. You will adapt quickly to this and your speech will not be permanently affected. Want to know more about Invisalign®? Consider Invisalign® to get the beautiful straight teeth you’ve always wanted – without braces. Request a complimentary consultation with Dr. F. Michael Sheehan to determine if Invisalign® is right for you. How can I find out if Invisalign is right for me? Learn more about Invisalign on their web site at www.invisalign.com, or call us today at 708-671-1510 for a free Invisalign consultation. You can also schedule an invisalign appointment online here.